During the 1870s and 1880s Poolend Street (renamed Court Road in 1890 at the suggestion of Lady Emily Foley) was one of the most dilapidated, disgusting areas of Malvern, where the drinking water was sometimes contaminated with sewage and illness was rife. A poem was written in 1882 describing the filthy, obnoxious state of the place and when the Leasehold Enfranchisement Act was being debated in 1889 pictures of Poolend Street '...were exhibited in the House of Commons to illustrate the evils of life leases'. There were no street lights, there was an unusually high number of fever cases, and the wells were frequently contaminated with sewage. Earlier, in 1867, there was 'sewage fever' in the road because the drinking water was contaminated. The doctors' prescription was that people should move. The installation of the Court Road Spout, with its supply of pure hill water, may have been the result of this mid-1860s crisis. It was definitely in place by the 1870s as it appears on a map of c.1876. The spout was fed with water from a cistern in the Rushey Valley, high up on the hillside. From there it flowed eastward through a 3in iron main both to this spout and to a nearby horse trough known as Poolend Spout. The spout has a grey brick surround and is built into the boundary wall of Prestbury (now Michael House) on the corner of Woodshears Road and Court Road. Behind the wall, to the right hand side, is a tank 12" x 18" x 48" deep (30cm x 45cm x 120cm) with 4" earthenware pipes leading into it. 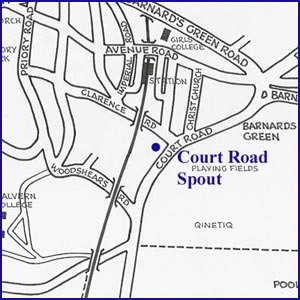 Court Road Spout is a modest source, reflecting the status of the people who originally used it. It was widely used until the late 1970s by children from the Chase and Mill Lane schools, who drank there on their way to and from school. Then for many years it lay neglected and unnoticed but in the autumn of 2007 the spout was unblocked by the residents of Michael House and now flows prolifically. As a result, in December 2007, the spout was awarded the St Werstan Award for the enhancement of Malvern's water heritage from the Friends of Malvern Springs and Wells. In the past this spout has erroneously been called Michael Spout but the spout predates Michael House. 2. The St Werstan Award ceremony 2007. L to R: Caroline Feast, Rob Stilliard from Malvern Water bottling works at Colwall, Merrick and Peter Feast with Bruce Osborne and Cora Weaver of Friends of Malvern Springs and Wells. Malvern Advertiser, 23 March 1889. The map alongside is a small section of our more comprehensive map of the area. For the complete map together with a description and history of this site see "Celebrated Springs of the Malvern Hills" (2012). Click on Website below or the top banner to go to the DISCOVERY TRAIL INDEX of springs and wells.